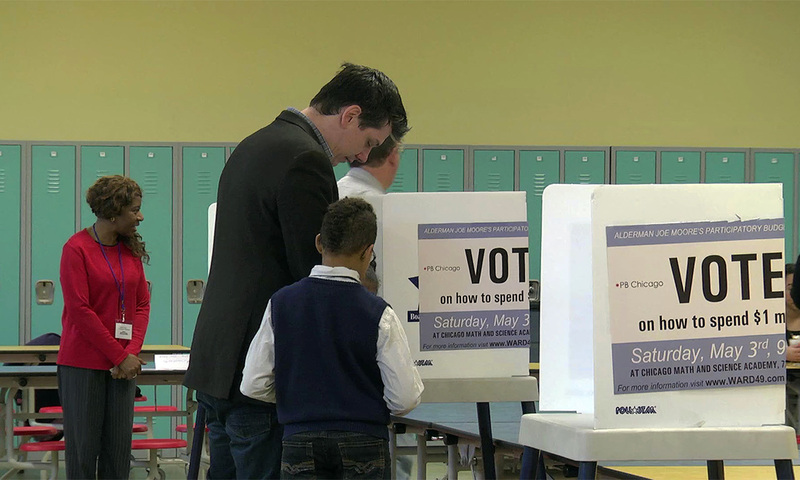 At a time when voter frustration is mounting, there's finally a good news story about money and voting: COUNT ME IN highlights an innovative experiment in direct democracy that gives ordinary Chicagoans direct say over local public projects and monies. Pioneered in Chicago, participatory budgeting is rapidly spreading across the country and even the White House recently made it one of its key recommendations for open government. The first in-depth documentary about this burgeoning national movement, COUNT ME IN tells the compelling stories of regular Chicagoans who are rolling up their sleeves to make an impact in their neighborhoods. The film shows residents pitch ideas for street repairs, bike lanes, or community gardens. Projects get researched, proposals crafted, and at the end, the entire community is invited to vote. Featured among the participants are Shannon Dudley, a retired IRS agent and passionate gardener; Joann Williams, a feisty community leader; and Maria Hadden, who began as a volunteer, but now teaches people in other Chicago wards how to implement participatory budgeting. But COUNT ME IN doesn't paint an overly rosy picture: power-sharing happens slowly in Chicago -- city agencies are slow to warm to the process and only a handful of aldermen have been willing to try participatory budgeting, even though residents find it empowering and a great tool for community building. WHERE IS PB HAPPENING IN CHICAGO? COUNT ME IN was filmed over the course of 3 years and we were also able to dip back into older material from 2009, when PB was first introduced to the U.S. by 49th Ward Alderman Joe Moore. During the 3 years of production, filmmaker Ines Sommer followed PB processes in the 49th Ward (Alderman Joe Moore), 5th Ward (Alderman Leslie Hairston), 22nd Ward (Alderman Ricardo Muñoz), and 27th Ward (Alderman Walter Burnett). Some PB processes – like the ones in the 45th and 49th wards – have continued for many years, while others have remained only a trial run. The main reason for discontinuing a PB process was the amount of staff time needed for administration and relatively low voter turn-out. As of Fall 2016, PB processes in Chicago are taking place in the 10th Ward (Alderman Susan Sadlowksi Garza), 17th Ward (Alderman David Moore), 31st Ward (Alderman Milly Santiago), 35th Ward (Alderman Carlos Rosa), 36th Ward (Alderman Gilbert Villegas), 45th Ward (Alderman John Arena), and 49th Ward (Alderman Joe Moore). Directed by Chicago filmmaker Ines Sommer and produced by her company Sommer Filmworks LLC, COUNT ME IN is presented nationally by WTTW Chicago and distributed to public television stations by NETA. COUNT ME IN was funded in part by a major grant from the John D. and Catherine T. MacArthur Foundation. Additional funding was provided by the Illinois Humanities Council (IHC), which is supported in part by the National Endowment for the Humanities (NEH) and the Illinois General Assembly.